ATLANTA, Sept. 18, 2015 /PRNewswire/ — Census Bureau data just released shows the lowest gender pay gap on record; still women earn 21 cents less than men on the dollar. Little PINK Book, America’s #1 digital platform for the nation’s 72 million working women, today announced that Alison Lewis, CMO Johnson & Johnson Consumer Companies; Ann-Marie Campbell, President Southern Division, The Home Depot; Bill Burke, COO, Newell Rubbermaid; Linda Galipeau, CEO, Randstad NA; and Tami Barron, CEO, SouthernLINC Wireless will offer guidance and lead discussion on how to move more women into leadership roles during PINK’s 11th Annual Fall Empowerment lunch on October 19th from 10:30am-2pm at the InterContinental Buckhead Atlanta hotel. Moderator Gloria Neal, CBS46 Morning Anchor, will guide panelists to tell their stories about earning the top job while enjoying the journey, and the personal price they paid for success. Click for details. 75% are confident they can attain life goals, yet only 27 percent are optimistic about achieving financial goals (Northwestern Mutual). Confidence plummets 60% within a few years of a new job (Bain and Company). How can women negotiate better for pay and promotions? How can they speed up advancement? How can climbing the proverbial ladder be more fun? These questions and more will be answered at this year’s event. 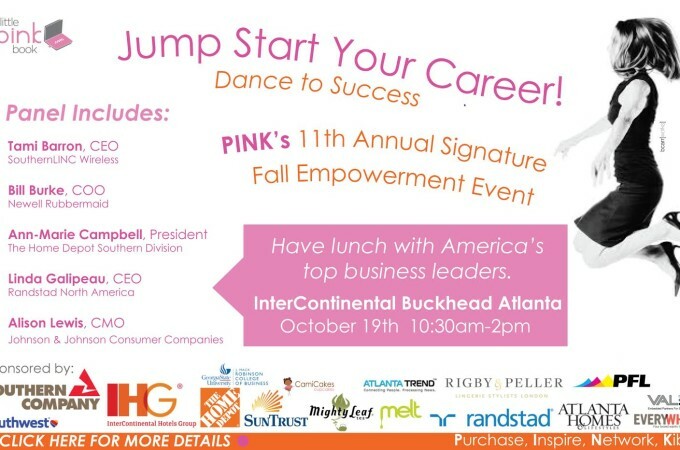 PINK’s Fall Empowerment Event, now in its second decade, brings together high potential women for leadership development and networking in a professional atmosphere and community. Five hundred women are expected to attend. The day begins with networking and shopping at the PINK Bazaar followed by lunch and panel discussion. 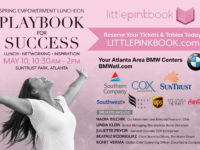 Sponsors include Southern Company, InterContinental Hotels Group, The Home Depot, Rigby & Peller, Southwest Airlines, Randstad USA, Mighty Leaf Tea, Melt, SunTrust, Everywhere, Atlanta Homes & Lifestyles, Valeo, GSU Robinson College of Business and Printing For Less. Nonprofit raffle proceeds will benefit The Dress Project supporting education for girls in Africa.